So I’m just going to cut right to the chase. Last night, I weighed in after one week following the new PointsPlus system on Weight Watchers (you can see my impressions of the new program here and here), and I was so happy to see that I lost 5.6 pounds in the first week! The best part is, I didn’t change my eating very much from my normal habits, I just was more conscious about eating fruits and vegetables, drinking my water, and measuring out portions rather than eyeing them. In the last week, I had THREE Christmas parties, and I still managed to lose a good amount. I’m so happy. 🙂 Onwards… exactly 16 to go! Last night I had a get together with three of my best girlfriends in DC, which is what I made the quinoa salad for. We had quite the spread but I only managed to snap a few photos. Cheese (montery jack and cheddar) and crackers. We also had hummus and pita chips and a spinach artichoke dip for appetizers but those came out later. I think one of the biggest changes I’ve made with holiday gatherings is trying to focus more on the company and less on the food (which isn’t easy for me!). I tried to position myself away from the cheese because thats my downfall and I will just keep eating it until its gone, which worked really well. 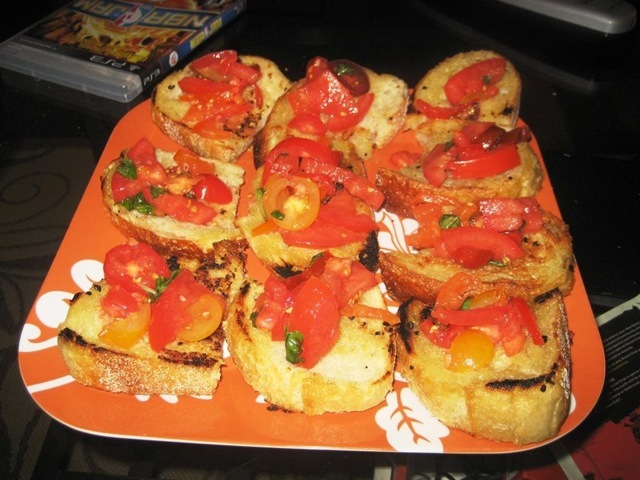 I had 3-4 pieces of the bruschetta, and some of each of the other apps. For the main course, we had veggie lasagna and the quinoa salad (good combo, right?) and I had a small serving of each. I also had a few glasses of wine, and had an awesome time hanging out with my friends who I hadn’t seen in a while. 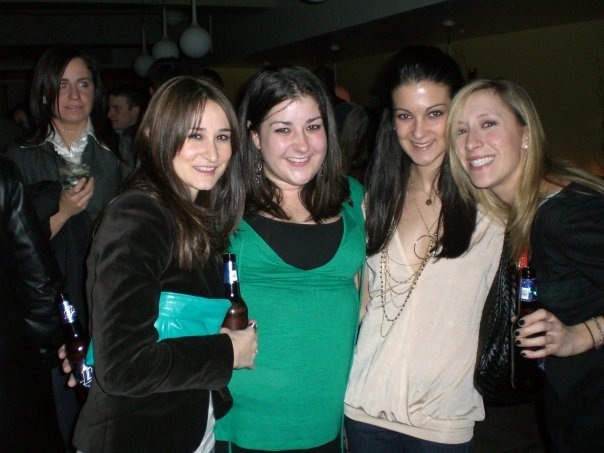 Lianne, Rachel, Jess, and Me. I left feeling good, but not stuffed, and had a really nice time. I even tracked everything to the best of my knowledge when I got home (which was 40 points even though I was conscious of it!!) and was in bed before 12. What are your best strategies for navigating holiday parties and not overdoing it? Recently, I’ve been trying to focus more on the company and less on the food, which is easier said than done. I also try to strategically sit myself away from the food so I can’t just mindlessly grab it. Also, I try to let myself have 2-3 of the things I really want, rather than try to only eat vegetables because I think I should, because I know I’ll crack if I don’t have what I really want! Sorry for disappearing! I took a sick day yesterday and was just feeling too lazy to blog, or do much of anything for that matter. The day mostly consisted of laying low and ordering Chinese for dinner. I got steamed veggie dumplings and egg drop soup, and also cooked a few shrimp from my grocery excursion on Sunday so they didn’t go bad. I also read this entire book over the weekend/yesterday. I highly, highly recommend it if you have ever been in the restaurant industry, you like food, and/or you like light beach reads. It’s about this girl, Adrienne, who moves to Nantucket to work at a restaurant for the summer, and I could not put it down. Back to work today, and back to Weight Watchers tonight! I wrote about my impressions of the Weight Watchers PointsPlus system the day after I started it, and now that I’ve been following it for a week I thought I’d update. I still really like the new program, and I definitely think its more in line with my style of eating than the old plan was. I think the fact that fruit is 0 is definitely my favorite part about the new plan, because I feel less stressed if I’m hungry – I can eat a banana, apple, or grapes no problem. Somehow carrot stick and/or celery just isn’t as satisfying for me if I’m truly hungry, so the flexibility with the fruit really helps. Also, I love that the daily points target is higher, even though a lot of foods have higher PointsPlus values than they used to. Having so many more points to work with makes me feel less limited, which was part of the problem with the old system for me. I feel like I have a lot more flexibility with this new program and that I’m not being punished by choosing whole foods because their points values are higher than the processed fat-free/sugar-free stuff, but rather encouraged to eat more unprocessed food. I think as someone who has struggled with my weight for my entire life, and still continues to, I really need the accountability factor that Weight Watchers gives me. Knowing that I am going to weigh in tonight stopped me from ordering fried tofu last night at delivery, but didn’t stop me from having some tasting some chocolate covered peanut brittle we got from Southern VA. I’ll let you know how weigh in goes tonight tomorrow morning. 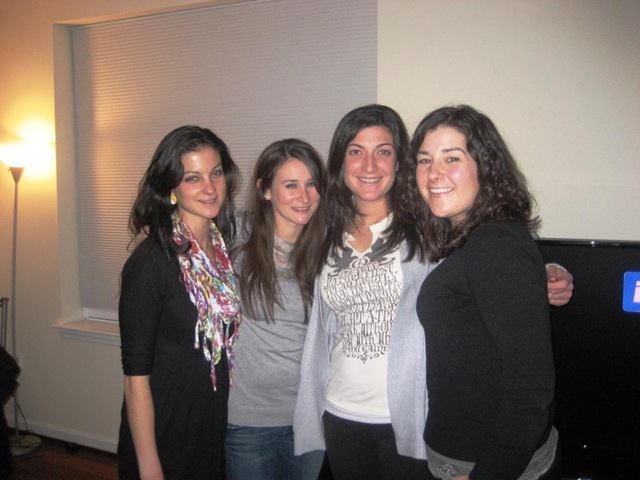 After weigh in, I have a mini holiday celebration with three of my best girlfriends – Lianne, Jess, and Rachel. We’re doing it potluck style, and I realized last night I needed to whip something up. I was pretty beat and not really in the mood to go to the store, so I wanted to make do with what I had. Enter.. Veggie Quinoa Salad with Honey Lime Dressing. 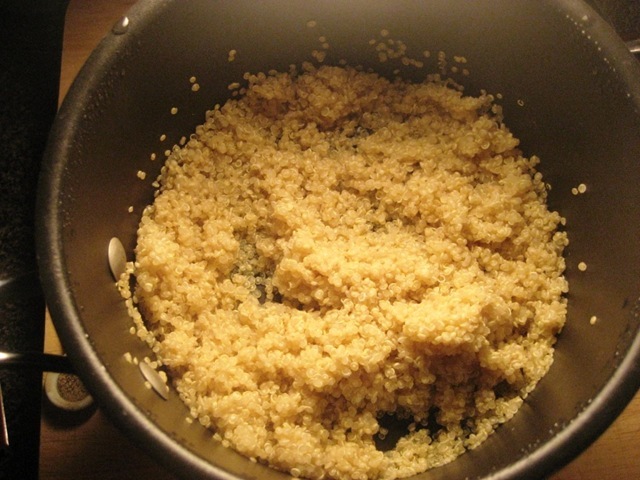 To start, rinse the dried quinoa, and add it to a pot with 2 cups water. 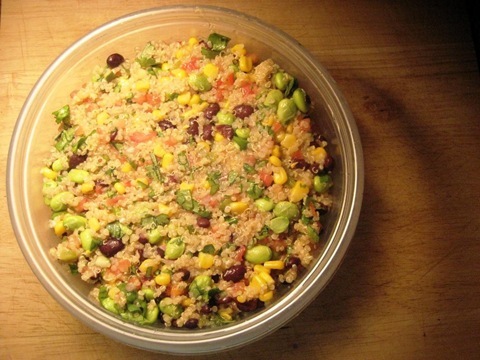 (Ratio is 1 part quinoa: 2 parts water, so you can adjust the recipe accordingly). Bring it to a boil, and then cover and bring it down to a simmer until all the water is absorbed, about 15 minutes. 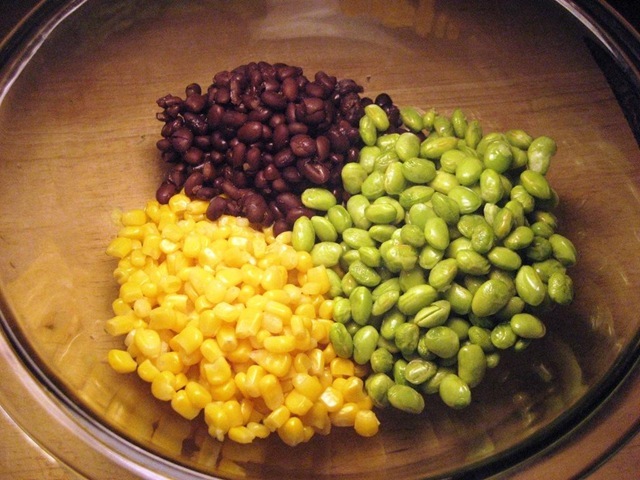 Meanwhile, combine 1 cup each black beans, corn, and edamame in a large bowl. Add in pico de gallo and cilantro, and mix to combine. Add dressing to veggie mixture, and stir in quinoa once its done cooking. 20 minutes and its done. It tastes really great, too. 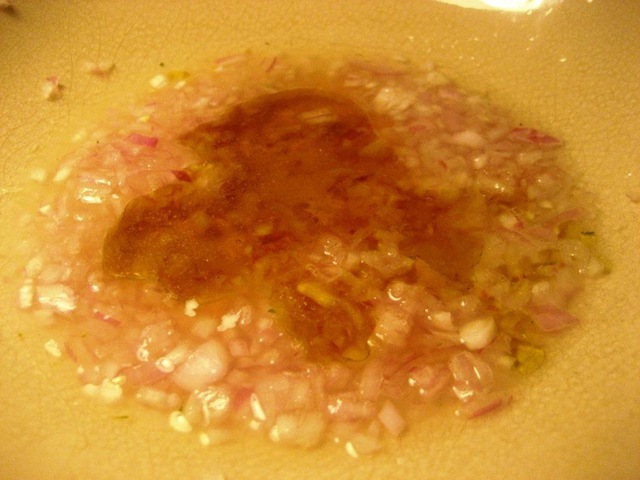 The sweetness from the honey and acidity from the lime are a perfect balance in the dressing and really tie everything together. The beauty of a dish like this is that you can use any vegetables, herbs, or grains you have on hand and change it accordingly. 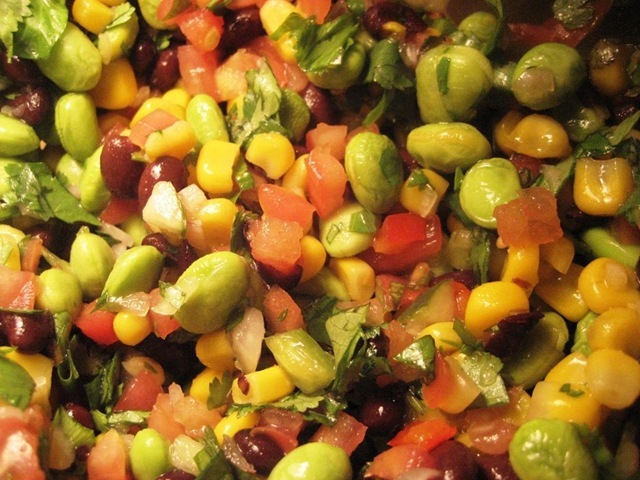 You can add in chicken or feta for an extra protein boost, or double up the amount of beans if you like. For 8 servings, this dish has 5 PointsPlus values each. 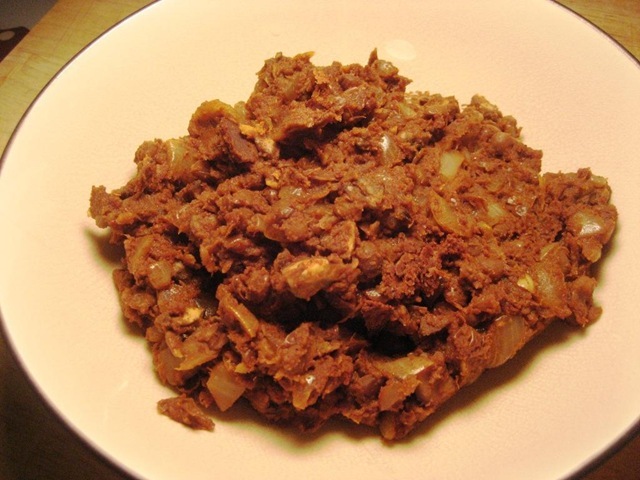 It can easily be more than 8 servings, or 4 huge servings that can serve as a full meal. What are some dishes you have come up with using mostly ingredients from your pantry/freezer? Morning and happy Friday!! So happy its finally here. Today is our office Christmas Party, which is super low key and held in our conference room but is always tons of fun. We get the main dishes catered, and then everyone brings in sides and desserts to complete the meal and we do a gift exchange. I’m excited for it! Last night, I had to make a treat to bring to the party, so a quick dinner was in order. 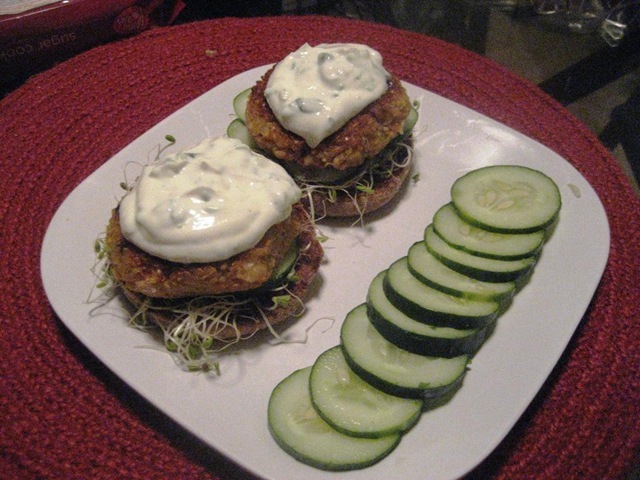 I made Open-Faced Quinoa Burger Sliders! With the leftover quinoa burgers from Wednesday night, I made one serving into two smaller burgers and ate them open faced on an english muffin. Doused, of course, in more of that same yogurt sauce. SO good. Seriously – the quinoa in the burger makes it crunchy on the outside and just adds such a great textural element to the traditional veggie burger. Yum. 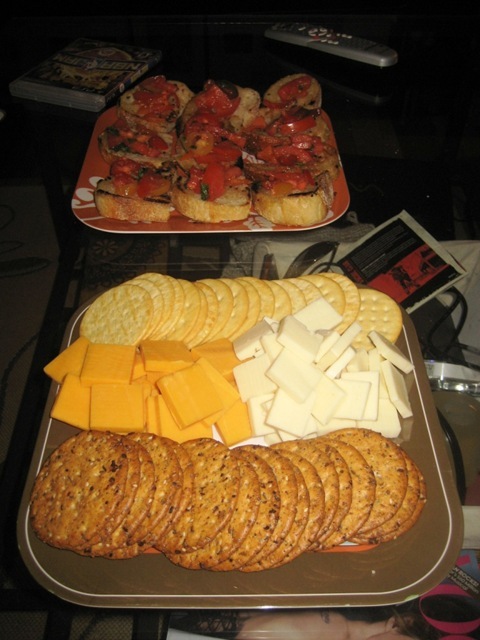 The reason for a quick dinner was because I had to get down to business making office treats! 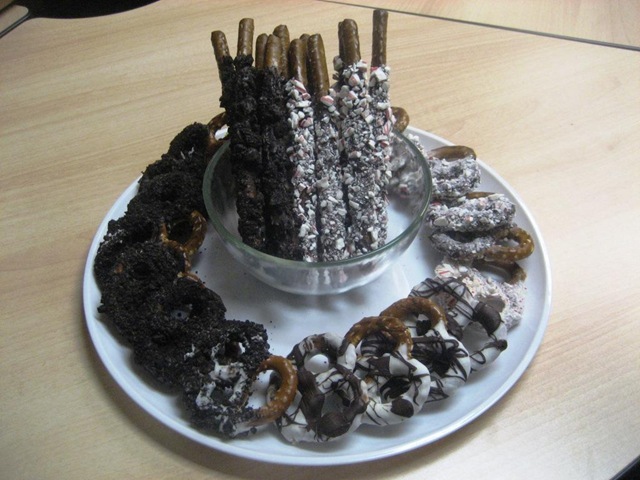 I decided to make chocolate covered pretzels dipped in different kinds of candy, and yesterday someone tweeted about Sabrina doing them with candy canes so I added that to my rotation as well. 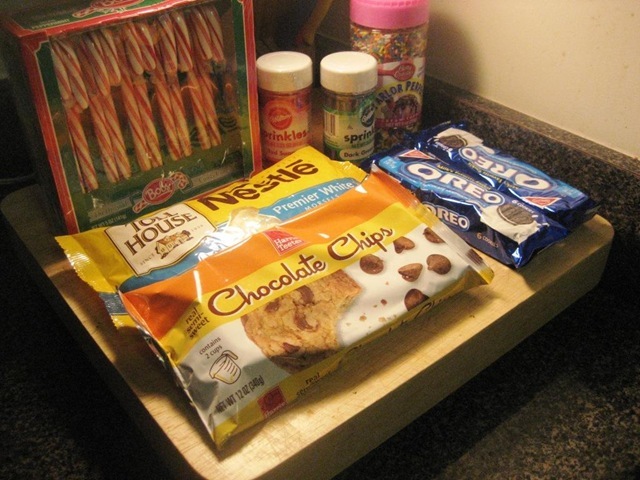 White and regular chocolate chips, oreos, sprinkles, and candy canes! 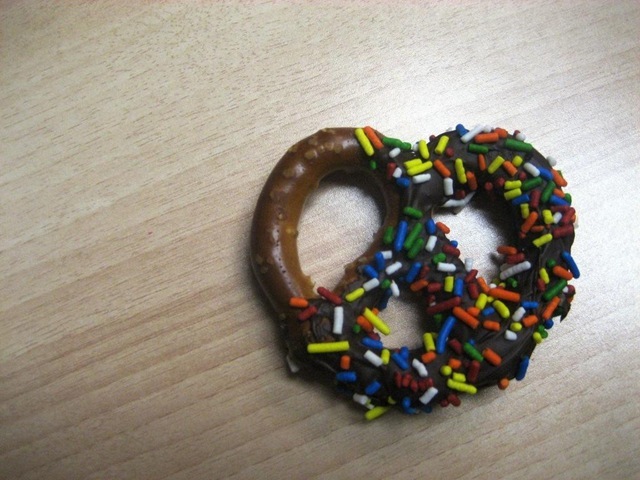 The other essential thing (besides pretzels) is wax paper – completely necessary! To start, crush up your toppings. 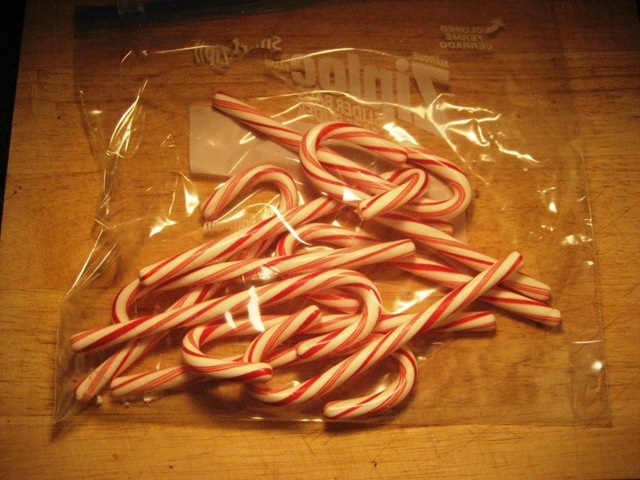 I unwrapped all the candy canes and put them in a large ziplock bag. 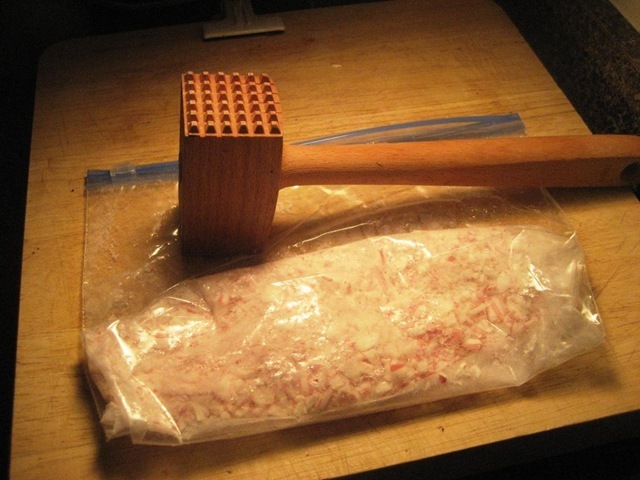 And then went to town with a meat tenderizer. Crush these until you think you’re done, and then keep going. The smaller the better because the smaller pieces stick much better to the chocolate! Once the toppings are prepped, you are ready to go. 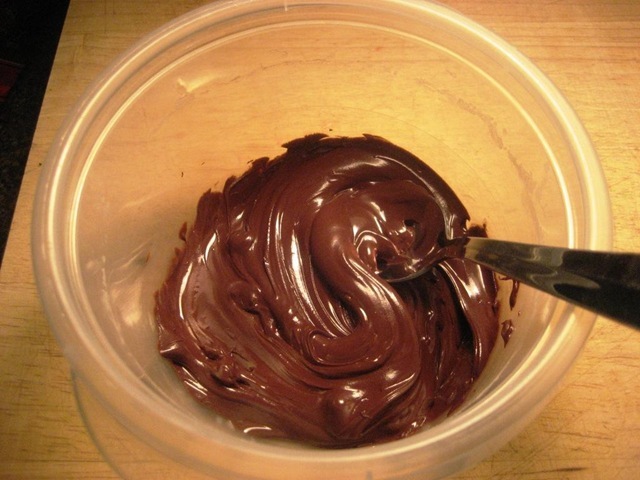 Start by melting some of the chocolate chips in 30 second increments in the microwave, stirring. I had to do each batch for 1 minute total to get it totally melted. 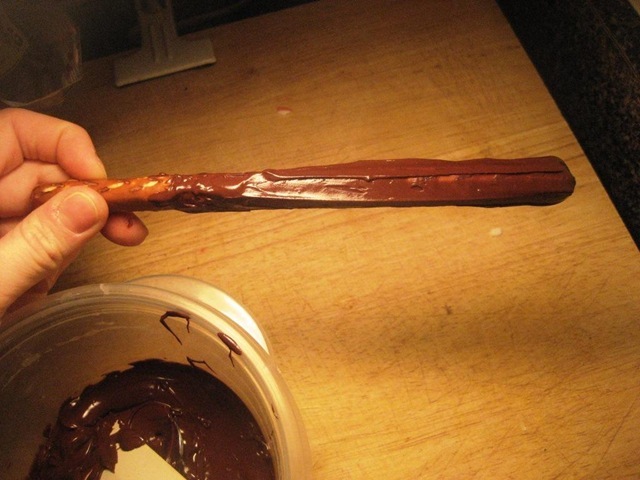 Coat your pretzel in chocolate, but don’t make the layer too thick. I used a spatula to scrape it down so there was only a relatively thin layer of chocolate on there. 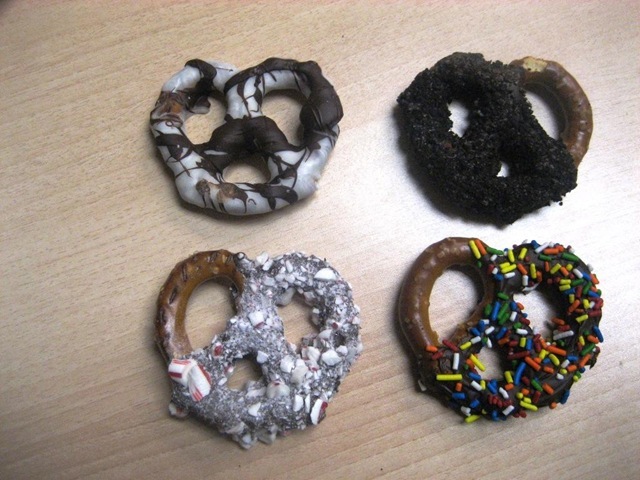 Next, roll your pretzel in whatever topping you want, and then set it on wax paper to cool. You will speed up the process (and help solidify the chocolate) if you put them in the fridge for a few minutes, which is what I did. I actually stored them in the fridge overnight to keep them solid, but they are now warming up to room temperature in preparation for the party. My intention was to take pictures with every step of the process, but it gets pretty messy and my hands sticky from the chocolate and candy, so I only have photos of the finished products! I did both pretzel rods and large pretzel twists. 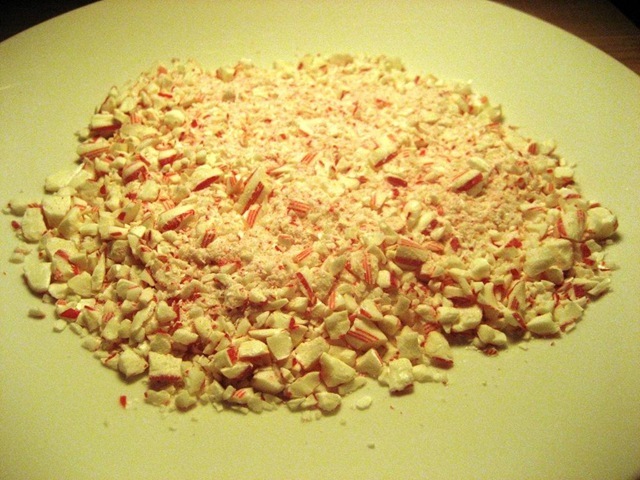 White chocolate drizzled with milk, and milk chocolate rolled in oreo, sprinkles, and candy cane. 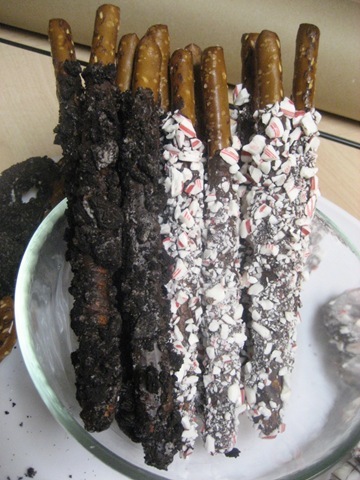 Pretzel rods dipped in milk or white chocolate, rolled in oreos and candy canes. I think the ones with the sprinkles are the cutest, but I only made 3 of them! Sad story. These treats look so fancy but are really simple to make. All the products are also super cheap, and you can make them festive to any occasion with different candy and colored sprinkles to dip in. The only problem was trying not to taste test during the process. Next time I will use gum. My first full day on the new Weight Watchers system was quite a success! The one thing I didn’t get in was exercise because I planned to get in a workout after work, but my friend Rachel called who I haven’t seen in ages and wanted to meet up. She lives about an hour away and was in town for something, so instead we went to Target together since that was on both our lists. Otherwise, I stayed totally on points without even trying really, and didn’t deviate too much from my regular eating plan besides being a bit more conscious, weighing and measuring serving sizes, avoiding the candy machine at the front of my office like the plague, and drinking lots of water. 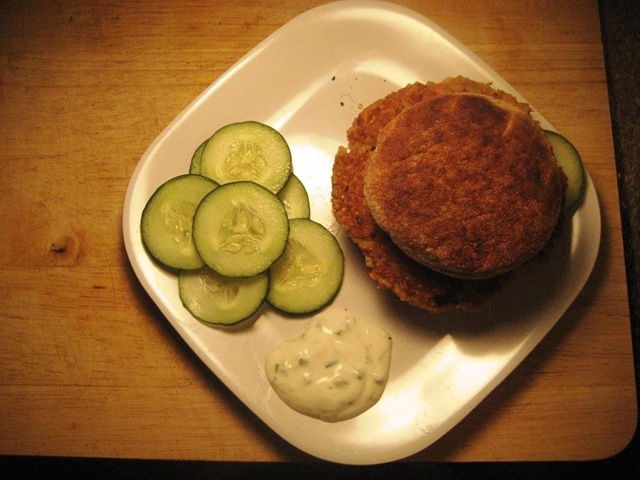 Dinner: Quinoa Burger (6 pts) cooked in 1 tsp olive oil (1 pt) on an english muffin (3 pts) with cucumbers (0 pts) sprouts (0 pts) and yogurt sauce (1 pt). These burgers are vegetarian, simple, and absolutely delicious. Here’s what you need. First, put 3/4 a cup of water on to boil, add the quinoa, and lower the heat and cover for 12 minutes, or until all the liquid is absorbed. While the quinoa is cooking, prep all your other ingredients. 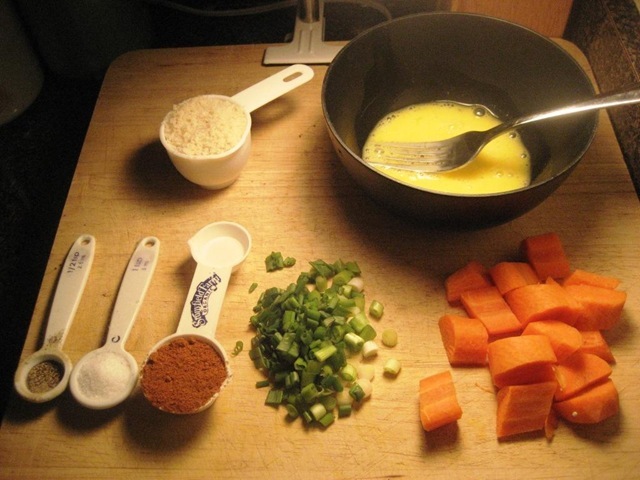 Chop up the scallions, peel and chop the carrot, beat the egg, and measure out your spices. 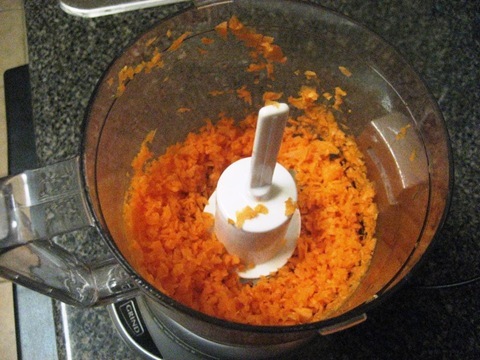 Next, process the carrots until they are ground up pretty well. Then add in the beans and pulse a few times until they are broken up but still chunky. 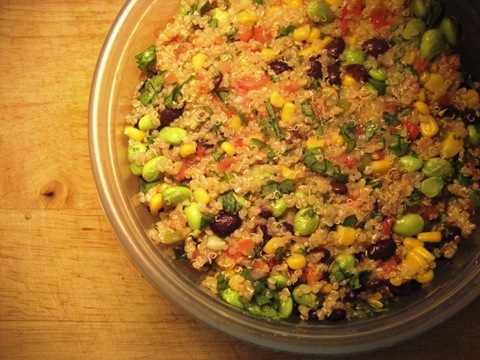 By now, your quinoa should be done cooking with all the liquid absorbed. 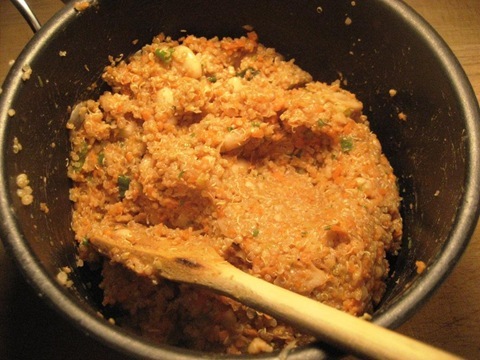 Add to that pot (off the heat) the carrot and bean mixture, the scallions, bread crumbs, egg, cumin, salt, and pepper. 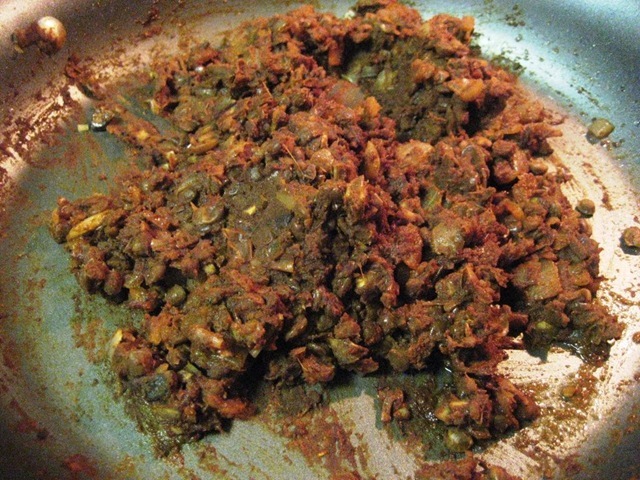 Doesn’t that look like ground turkey?? Scary. Now it’s time to make the burgers. 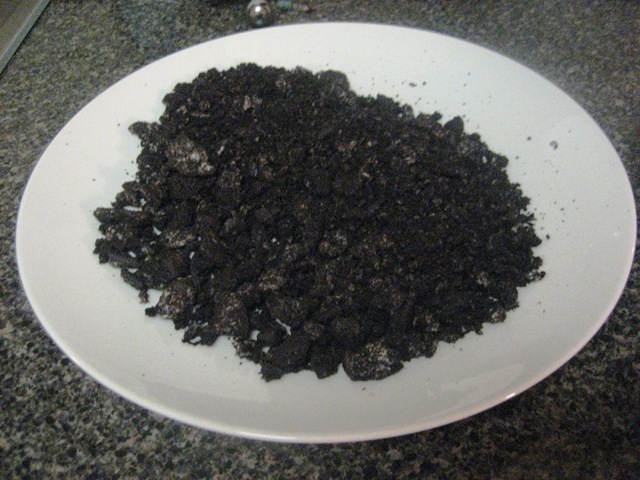 If the mixture is a little soft, you can put it in the fridge or freezer for a few minutes to firm it up. 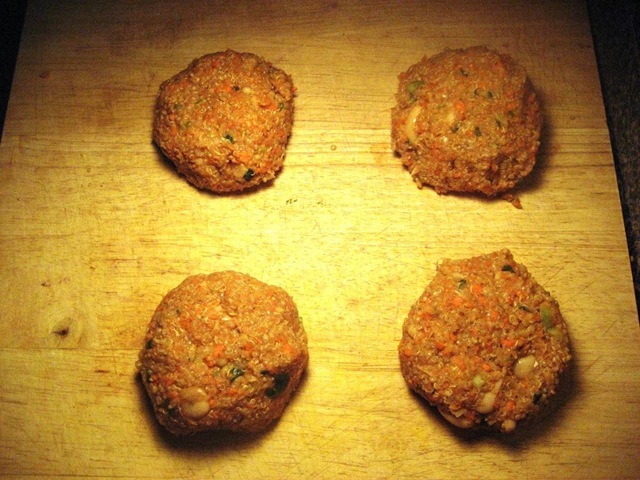 Otherwise, form into 4 patties. I froze two of these at this stage, and then put one in the fridge for sometime soon, and cooked one for dinner last night. 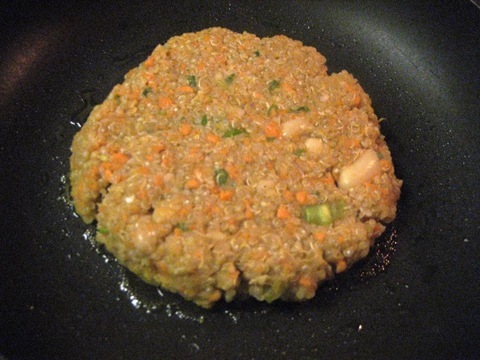 To cook, heat up 1 tsp of olive oil in a pan, and add in your quinoa burger. Flatten it so its no more than 1 inch thick because it needs to cook through because of the raw egg. Cook over medium for about 5 minutes a side, and flip once brown and crispy. I made a quick yogurt sauce to go with it, by combining 1/4 cup greek yogurt, the juice of half a lemon, 1 scallion, and a touch of salt and pepper. 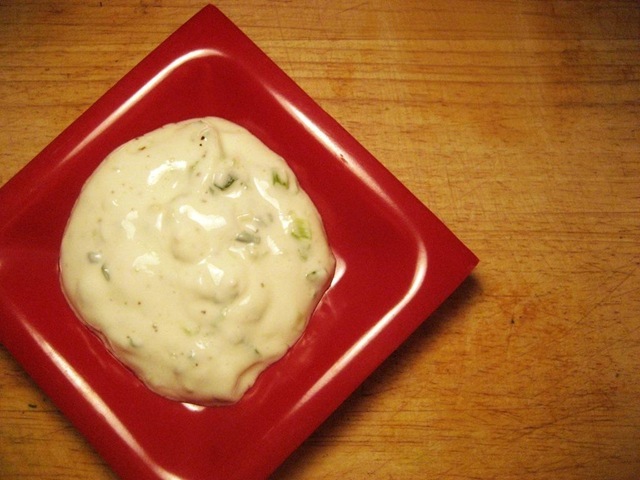 It was delicious and a great, easy (1 pt) sauce that you can use to top a lot of different things if you’re looking for a tzatziki-esque sauce. I served my quinoa burger on a toasted english muffin with some sprouts and cucumbers, and of course, a heavy dollop of the sauce. The english muffin was a little small for the burger, so next time I’d probably make 2 smaller patties and have them openface for the same number of points. Points aside, this burger was amazing. 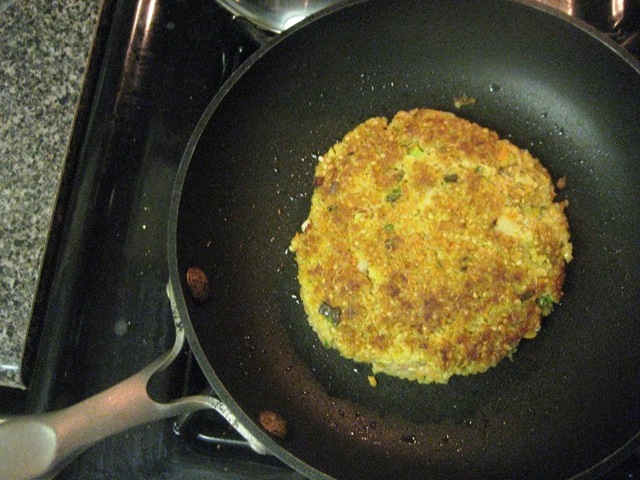 The quinoa gets a little crunchy from pan frying it and the flavor is spot on. 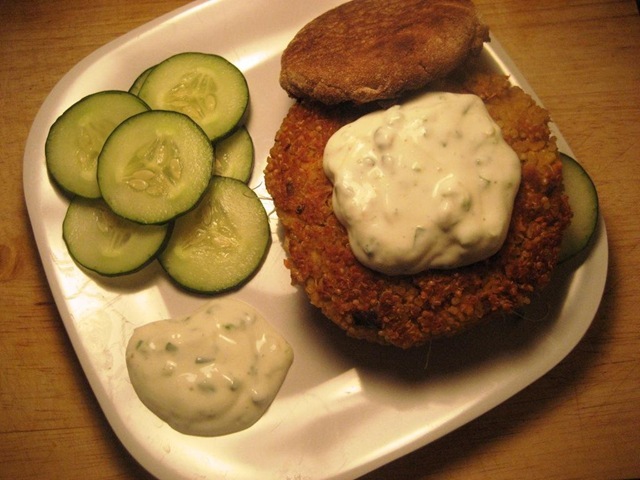 These are delicious for a meat eater or not, and the sauce works perfectly against the cumin flavor in the burger. 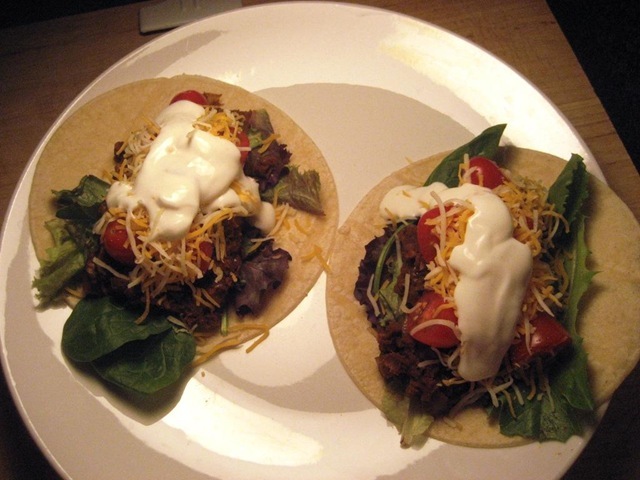 After this post, I might have to have this again for dinner rather than my black bean enchiladas as planned. Yum. What is your favorite kind of burger? 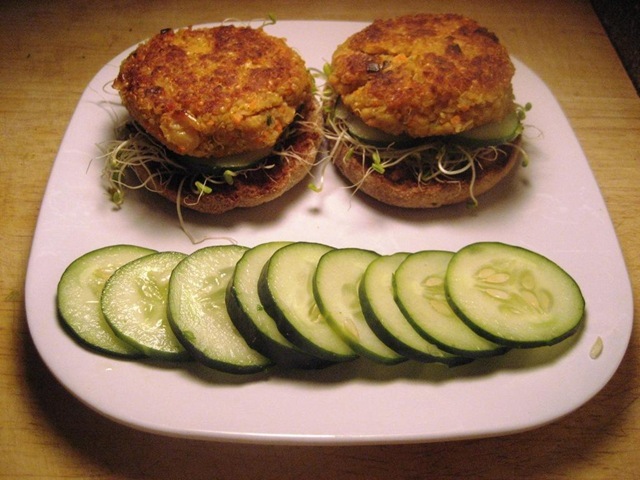 Have you ever made veggie burgers at home? So I took the plunge and rejoined Weight Watchers last night. 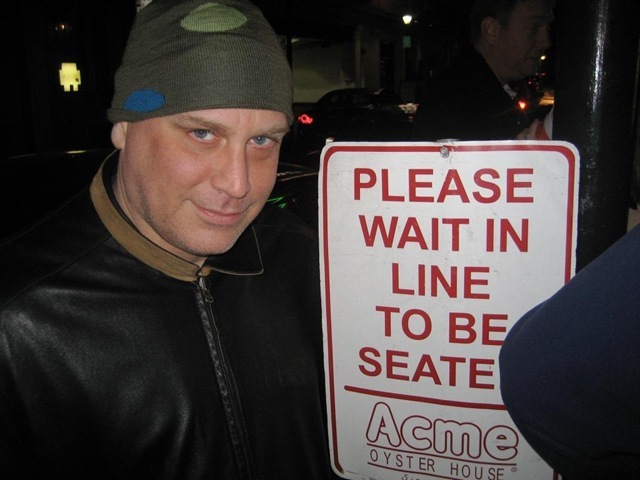 After my extremely indulgent trip to New Orleans (more to come on that! ), I was feeling readier than ever to commit to losing the last pounds I need to to get to my goal. 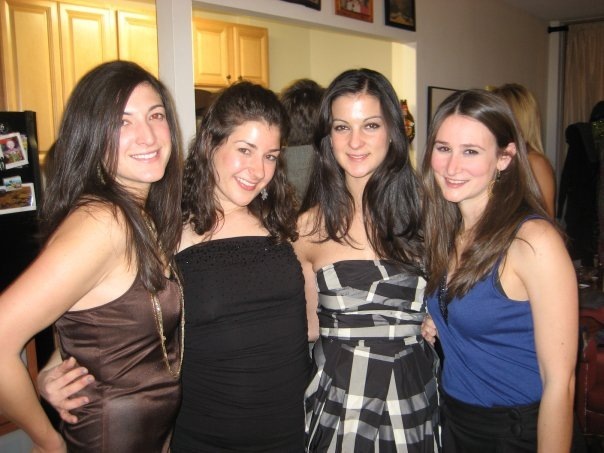 I had a few friends and readers meet me at the meeting, so that was really nice – Meg, Elizabeth and Liz. I need to lose 21.6 pounds to be at my goal. That feels like a lot more than I was expecting it to be, but I know that I’ll lose a lot the first week if I focus on clean eating and combat the bloat that is still lingering from New Orleans. With the new program, you get a bunch of materials at your first weigh in. 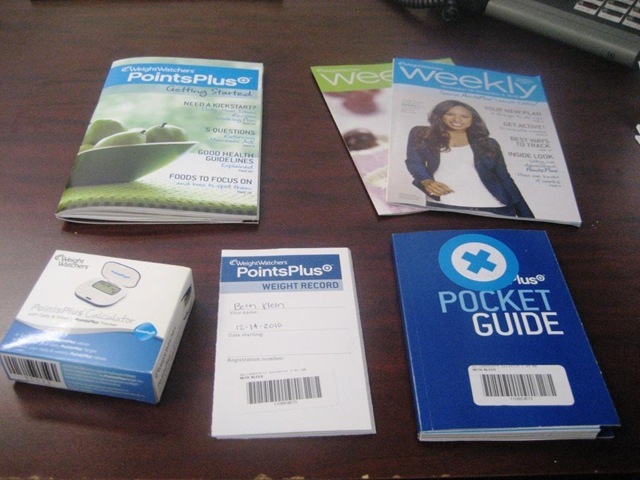 The Pocket Guide (lower right) and the PointsPlus Getting Started (top left) basically replace all the weekly books you get with the old program and have all the information you need. You also get the Weight Watchers Weekly, and they gave me the one from the first week which talks about transitioning to the new program and the main differences between the old and the new one. There’s also the PointsPlus Weight Record, which fits handily into the Pocket Guide. I also purchased the PointsPlus Calculator, which is on promotion for 5.95. I used it last night at the grocery store a few times so I’d say its worth it. In terms of the plan itself, it seems really good to me. The basic premise behind the changed science is that our bodies process different types of calories differently, so the PointsPlus calculations look just at protein, fiber, fat, and carbohydrates, not calories (though calories are derived from the number of grams of protein, fat, and carbohydrates, so in a way its in there). 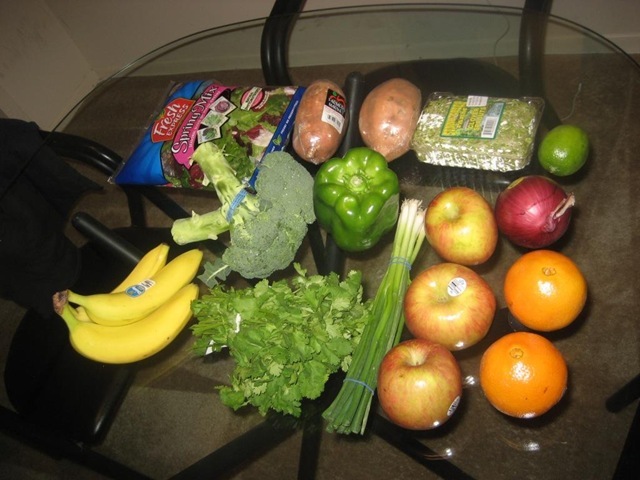 The plan focuses on having you eat more protein and natural fiber, and I do notice a trend towards less processed foods. However, there is still a big emphasis on fat free cheese which drives me a little nuts, but hey – nobody’s perfect. I’m not really sure what exactly I was expecting, but the plan itself hasn’t really changed that much in my opinion. I do love that fruit is zero, and a lot of the foods that I eat on a regular basis are what they refer to now as “Power Foods,” which you’re supposed to try to focus most of your diet on. The one sad point discovery for me (to date) is that oatmeal is now 4 points for a serving! It used to be 2, and when I looked that up yesterday I was a little taken aback. That said, peanut flour is only 1 pt for 1/4 cup (which adds 16 grams of protein!! ), and the banana I use on top of my oats is free – so my standard bowl of oats hasn’t changed in value at all. After my meeting, I did my first grocery trip in too long, and managed to do really well. 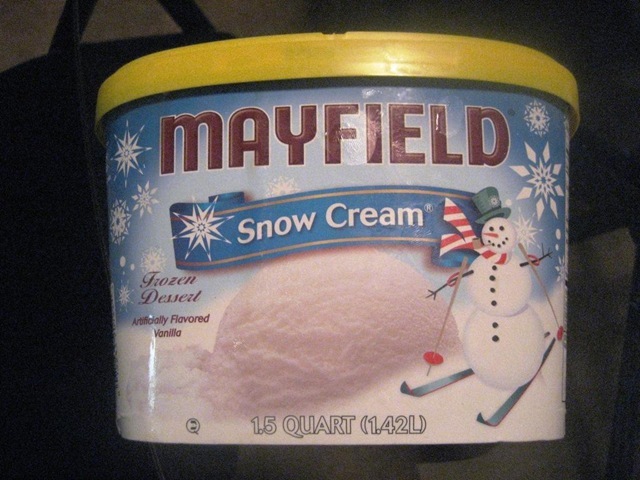 The Mayfield Snow Cream caught my eye because of the sale for 1.99 from 5.99. 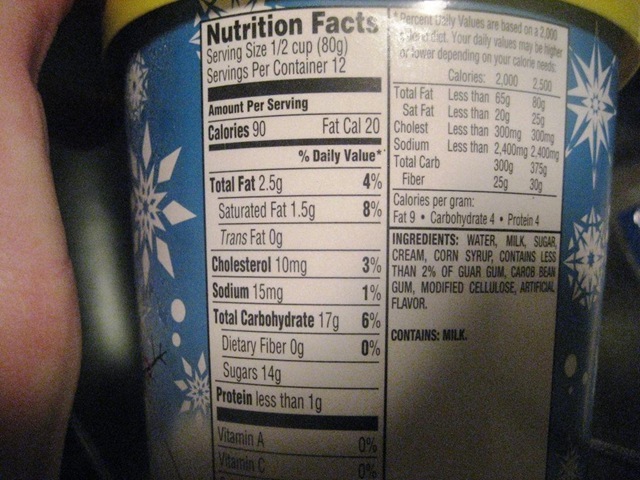 Then I looked at the nutrition facts and ingredient list, and I was sold! I haven’t tried it yet, but those stats were impressive to me. It would have been just 2 points on the old plan, but is 3 on the new plan. Boo. 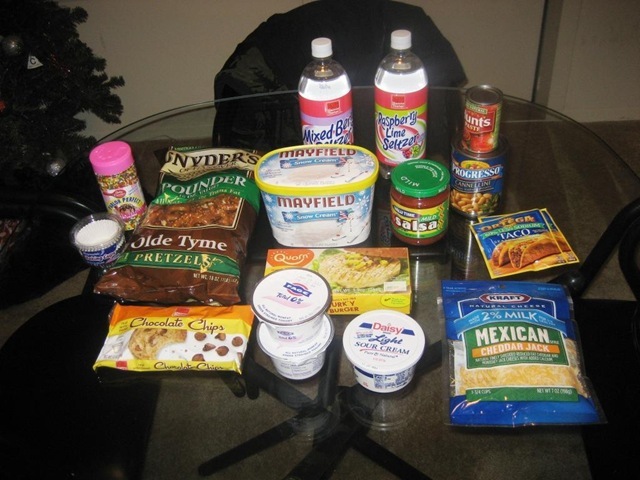 What diet products skeeve you out? For me – spray butter (though I used to use it a lot), fat free cheese (same story) and fat free gravy (never!). Getting to New Orleans was pretty uneventful. 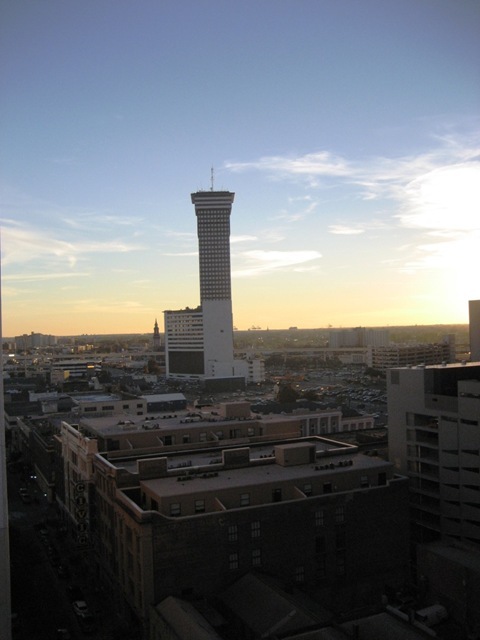 Our flight was at 2:20pm on Thursday afternoon, so we landed in NOLA just before 4 and got in a cab to our hotel. We were totally blessed with gorgeous, warm weather the first few days, and got so excited when we first spotted our hotel from the street! Le Pavillon. 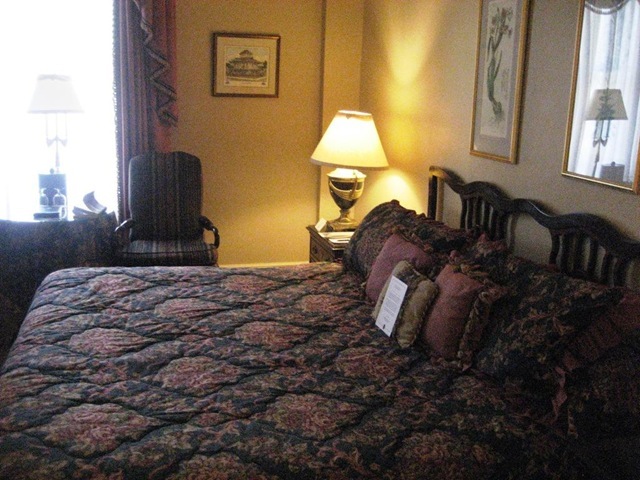 It is a historic hotel just a few blocks from the main strip and was super nice but also kind of old fashioned with the decor. Southern Charm. Legend has it the hotel was haunted, but the only time we heard/saw a ghost was when someone (not me, but I’m not pointing fingers) farted and claimed it was a ghost. Ha. We went up to check out the roof and it had such a great view! 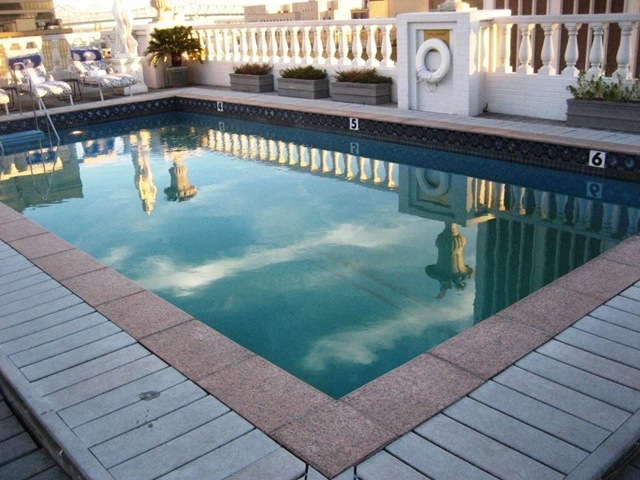 Though we both brought swimming suits, we didn’t get a chance to use the pool even once. Boo! 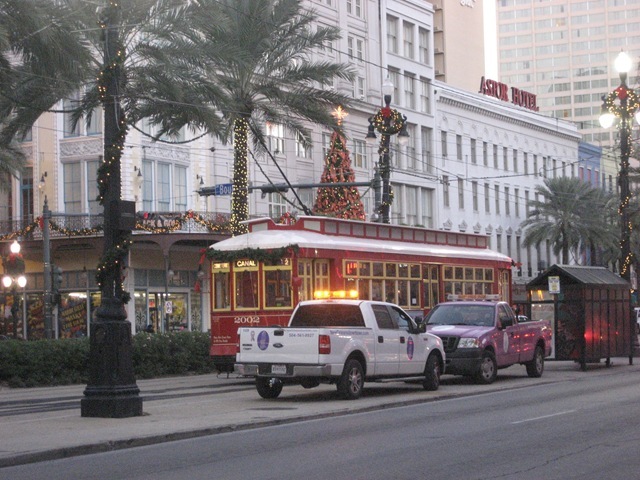 After settling into our hotel, we decided to set out an explore a bit and walked all over the French Quarter and down Canal Street and Bourbon Street. It was so cool to see! 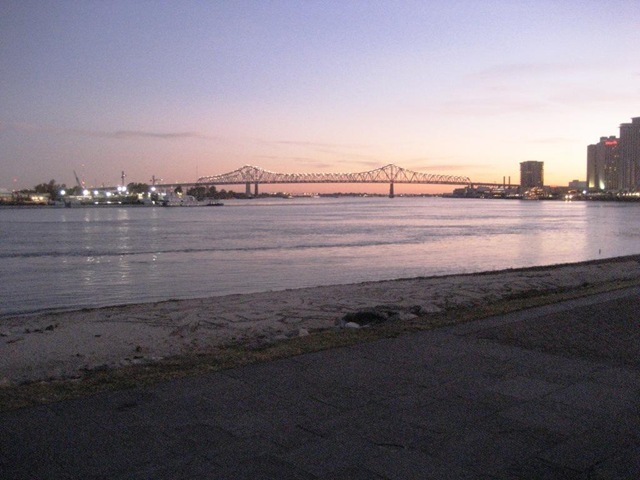 The French Quarter is right on the water (apparently) because we were just wandering around and all of a sudden ended up on a beach with the sun setting with gorgeous views. Hunger quickly kicked in so we set out to find somewhere to eat with no real plan in mind. 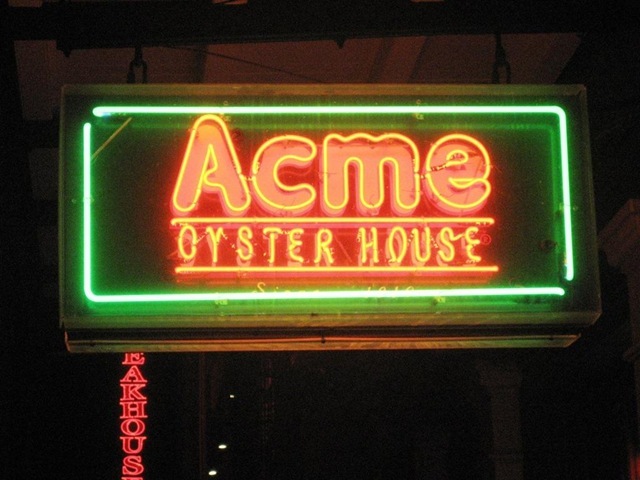 I spotted Acme Oyster House which had been recommended by several people and was one of the places on our list we wanted to get to while there. The line was pretty long to get in. But we amused ourselves by drinking beer on the street, and it moved quite quickly. We ended up getting a spot at the bar, which is actually our preferred place to sit in most restaurants. They were shucking the oysters right there in front of us and we were able to talk to the people working there and get some suggestions about things to do and see. 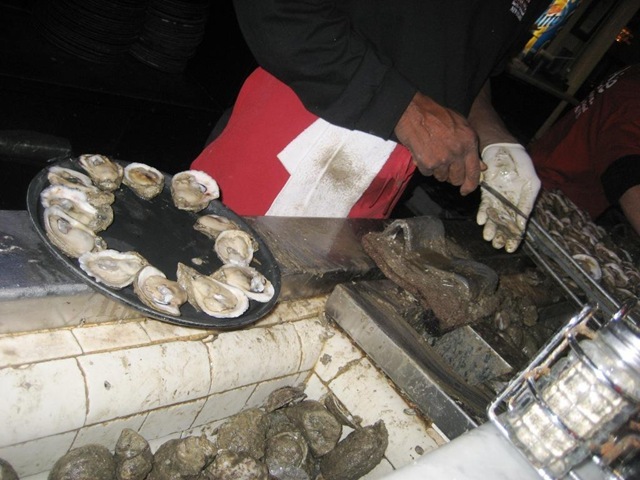 If you notice, the oysters are covered in mud, and they don’t wash them off before shucking them, they just open the up and put them on platters while still dirty. We asked the Master Shucker why that is, and he said when you rinse them off the temperature warms so that the oysters open ever so slightly, and dirt can actually get into the oysters. They don’t wash them so the shells are dirty, but the inside of the oysters are perfectly clean and delicious. x2, plus a pitcher of beer, fried crawfish, hush puppies, and potato salad. We had grand plans to go find a brass band, but were tired and feeling kind of lame, so went home instead and were passed out by 10:30pm. Sad, I know. The next morning (Wil’s birthday), I woke up early in search of the gym. 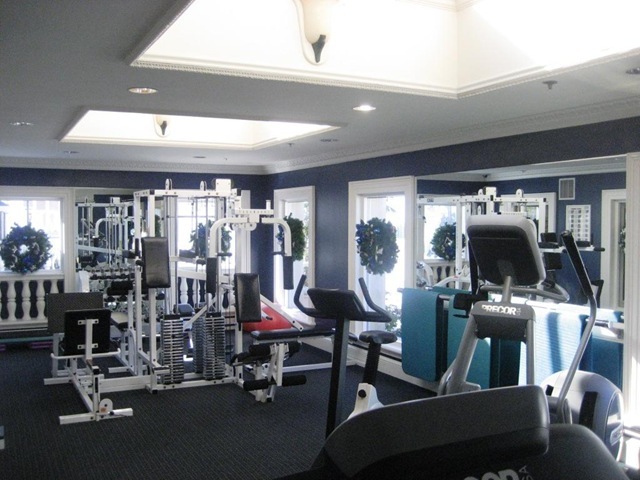 It was one of the nicest hotel gym I’ve ever used. There were 2 treadmills, an elliptical, and 2 bikes for cardio equipment. 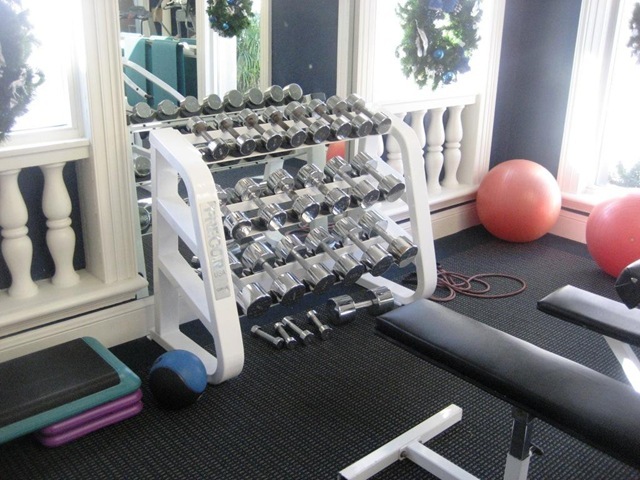 Plus a huge weight machine (is that what you call it? ), free weights, stability balls, resistance bands, a weighted medicine ball, and a step. 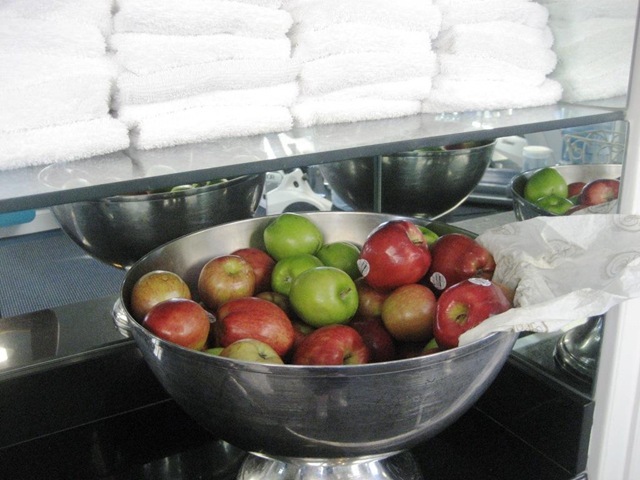 Definitely one of my favorite parts about nice hotel gyms! I was a little crunched for time, so I ran for 35 minutes and walked for 5 to cool down. I covered 3.7 miles during the run portion, and just under 4.0 during the run plus cooldown. 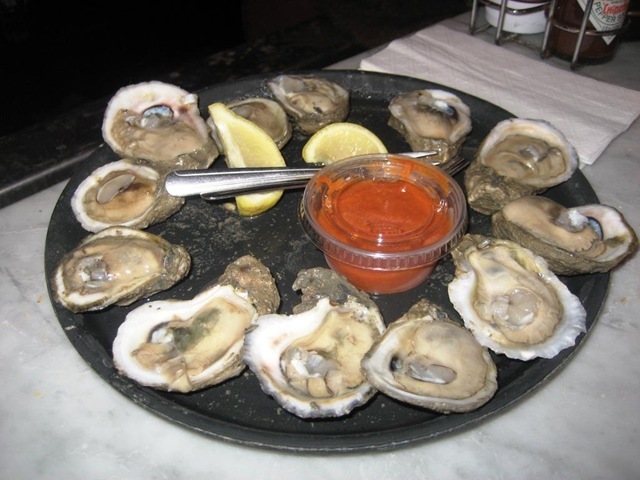 Are you a fan of oysters? Do you like them raw, cooked, or fried? I LOVE oysters every which way! New Orleans was SO fun. We had such an amazing time and ate so much delicious food, saw great live music, and did a lot of walking around and exploring the city! I even managed to squeeze in two workouts while I was there.. be proud (I am!). I am feeling ready for some detox from both drinking and fried food, so am very much looking forward to rejoining Weight Watchers tomorrow night. The fun ended a little later than plan because after we packed up and checked out of the hotel yesterday, I got a call saying our flight home was canceled. They had rebooked us on a flight this morning, but instead of the direct flight with seats next to each other like the original flight, we had a 3 hour layover in Charlotte, NC and were both smushed in middle seats in a completely sold-out plane. Talk about a downgrade. 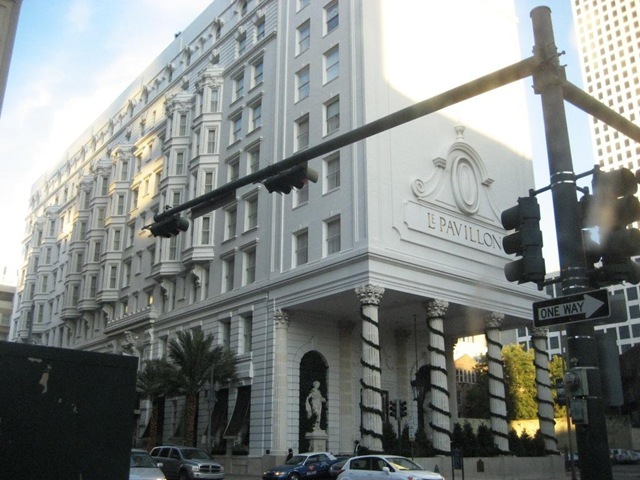 We also had to buy another hotel night, and even though there are much, much worse places to get stuck than New Orleans, we were literally packed and ready to go when the call came so it kind of put a damper on the end of the trip. Our flight out of New Orleans was at 6am this morning, so I am kind of a zombie and though I did make it to work for a few hours, I have a lot to get done before I feel settled.. including unpack, grocery shop, laundry, buy bigger pants, etc. I promise a full recap (probably spread out over a few days to spare you!) but for now, let me leave you with a few highlights from the trip. One of the most common questions that I get from readers is what the turning point for me was in my healthiness journey, and how I got myself to a place where I was ready and able to change. Let me tell you – it was not easy, and it was, and still is, a very long road. I figured I’d take the opportunity to address it here since its a question I get pretty frequently. I was overweight for my entire life since I was a kid, and then after high school I just started piling on the weight like it was my job. (It wasn’t). I had a boyfriend that I met on the first day of classes freshman year and that sort of solidified my unhealthy lifestyle because we would just stay in every night, order in pizza, wings, and other greasy food, and chain smoke cigarettes. I didn’t get any activity in or eat anything even remotely healthy during those 3 years. Once he graduated (and we thankfully broke up), during my senior year of college I started focusing on myself, working out, and following Atkins. 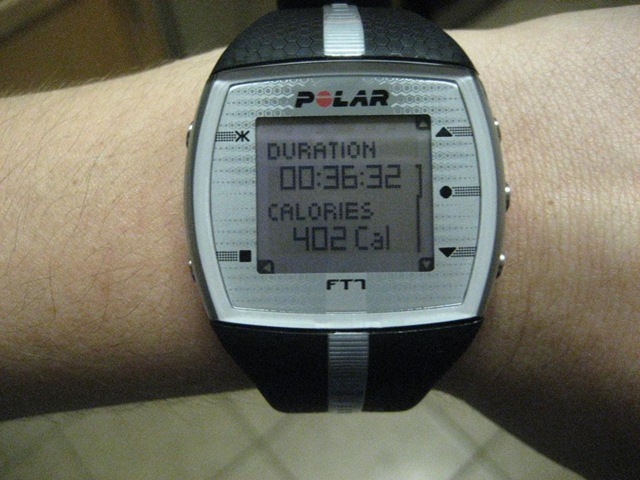 I followed that program for several months, lost around 40 pounds, and felt amazing. 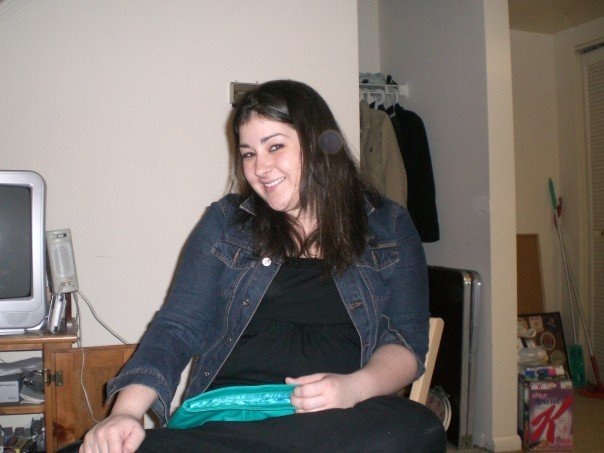 Then, after graduating from college and moving out on my own, I let the weight creep back on quickly. 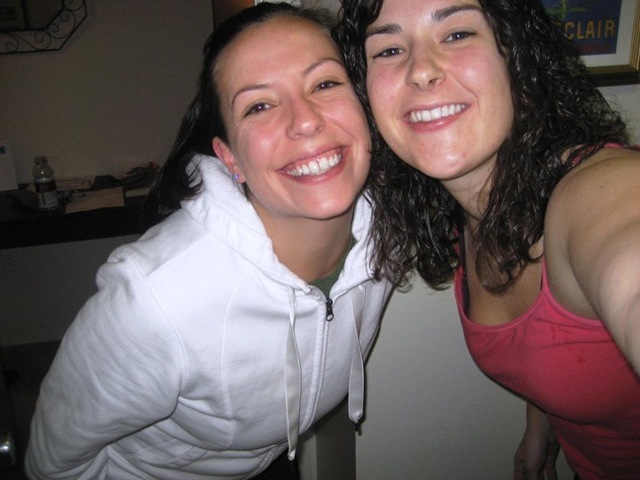 That’s a photo of me and my old roommate, Molly (who later went on to join WW and become lifetime!). I gained back about 35 of the 40 pounds I had lost because we worked at a restaurant, drank all the time, kept terrible hours, didn’t work out, and binged on junk food like it was going out of style. 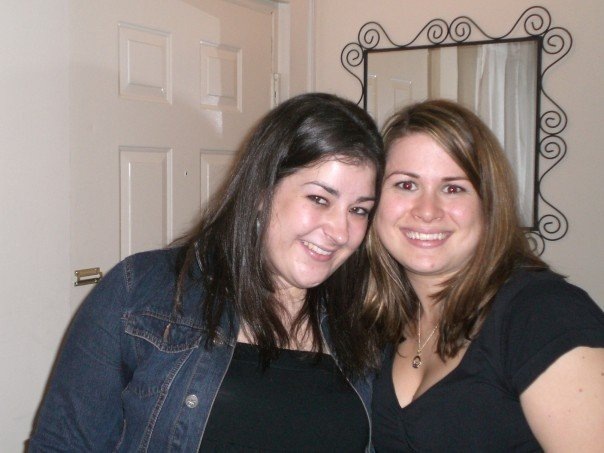 Since that photo, we’ve lost over 100 pounds between us. 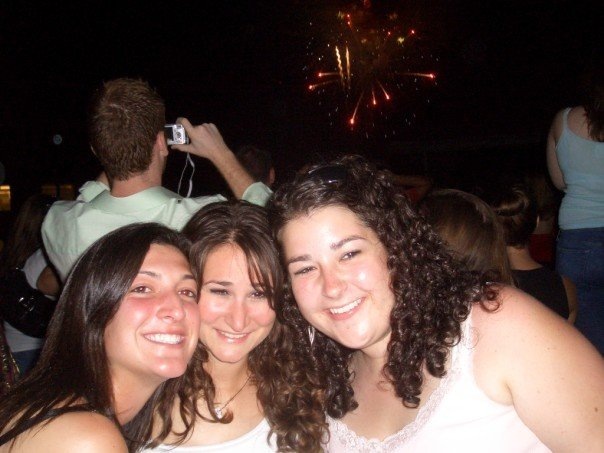 That’s Jess, Rachel, and Me back in 2006/2007. So my turning point really came after I had lost and then gained back the weight. I got back up to wearing a size 16/18 in pants and XXL shirts. While on the outside I was putting on a smile, going out often, and surrounded by friends, I was really miserable on the inside. Pretending everyday that I was comfortable in my own skin really took a toll on me. 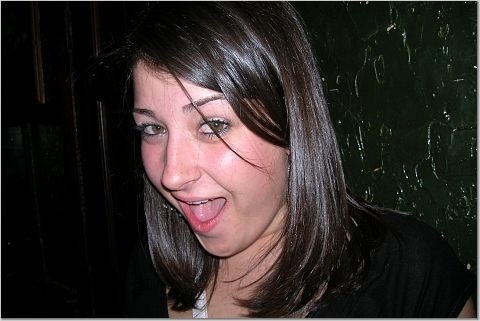 I was and always have been pretty outgoing and outspoken, so I was the funny, fat friend/coworker/sister/daughter. I didn’t want to be that anymore. In late 2008, I had a doctors visit with my gynecologist, and she said “So, what’s going on with your weight?” She said it so casually, like “How are you?” or “Did you hear about the weather for the weekend?” I was completely taken aback. I knew my weight had gotten out of hand but it was sort of like the elephant in the room – everyone could see it, but there was absolutely no need whatsoever to discuss it. I left the doctors office feeling defeated, angry, even offended, but that was really what started the fire in me. I didn’t want to have to get asked questions like that ever again. At first, I thought I should try do it on my own since I had done it before, but I knew Atkins wasn’t a long-term solution to my problem. In January 2009, I decided to make “get healthy” my New Years Resolution, but I really had no idea where that would take me. I first started by quitting cigarettes, which was a hard process and I’ve had several relapses along the way. After cutting back dramatically on smoking, I started working out. 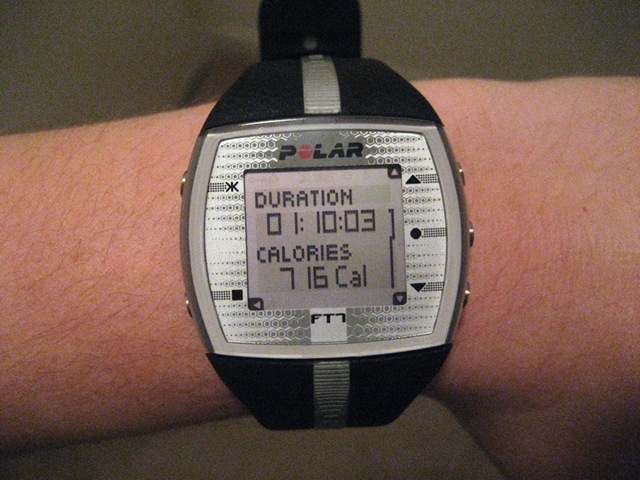 I started working out 4 or so times a week at the gym, mostly doing the elliptical and/or weight machines. I tried that for 2 months to no avail. I wasn’t doing anything to change my eating habits, so I wasn’t losing weight. The problem for me wasn’t that I didn’t know what to eat or what was healthy, but that I ate way too much. I soon realized I couldn’t do it on my own. I needed a system to hold me accountable and help me navigate through all the healthy choices I knew about – and that’s where Weight Watchers came in. I decided to commit to it and started religiously counting points and completely changing everything in stock in my kitchen. I remember I lost 6.2 pounds that first week and almost screamed because I was so excited. After that first week, I continued to lose, albeit slowly, and by January 2010, I was the thinnest I’d ever been in my life. There were many times where I wanted to give up because I had to make a lot of sacrifices like skipping out on happy hours, waking up extra early to get in a workout, and not eating the pizza that everyone around me was eating. It felt unfair that I had to make these changes and everyone else around me could eat whatever they wanted. But the truth was, most people can’t eat anything they want all the time and stay thin. Most people have to make sacrifices and perhaps they eat the pizza in public, but who knows what their lifestyle is like at home. I guess a big point for me was realizing this journey was about me and no one else. In the end, all the sacrifices I made were worth it. If I screwed up and went out and drank too much and ordered pizza, I woke up the next day (feeling like crap) and would pick up the pieces. You can’t be perfect. You can’t change overnight. But in the end, it’ll all be worth it – I promise. I always wanted an easy solution, to just be able to wish being skinny and for it to work. But the truth is and I’m sorry to say it – there’s no easy solution. You need to watch what you eat and work out, and you can change your life too. You will have slip ups inevitably – don’t let yourself get discouraged. In my prior life, I would try to be healthy and would wake up and eat really lightly during the morning and daytime, only to overeat at night, feel extremely guilty, and then continue to eat until I was numb. The next day, I’d wake up and do it again. I learned (slowly) to switch my obsessions about food to healthy food and experimenting with new recipes and new superfoods (and starting a blog). 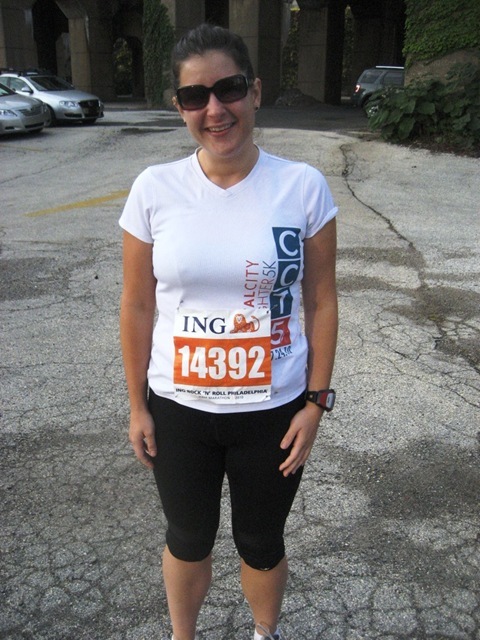 I started running, and that same addiction that led me to be obese has lead me to run 9 races, including a half marathon, and I’m signed up for another one in 2011. Take it slow and realize if you are persistent, you will get there. Did you have a turning point that led you to change your life? What was it? 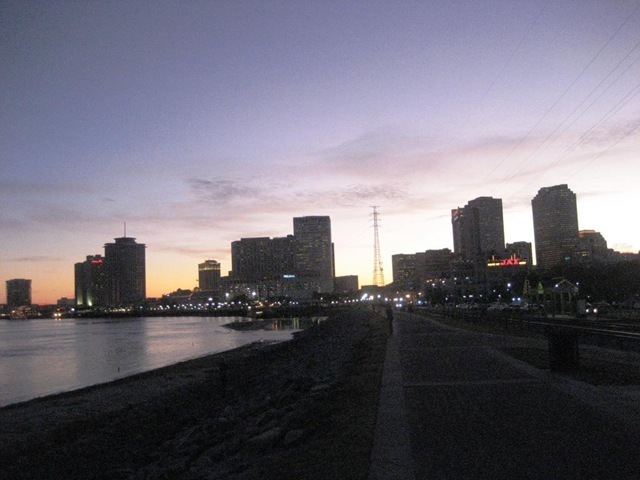 I cannot BELIEVE tomorrow is the day I go to New Orleans! When I booked the trip so many months ago, it seemed so far away and now, it’s here! So excited! 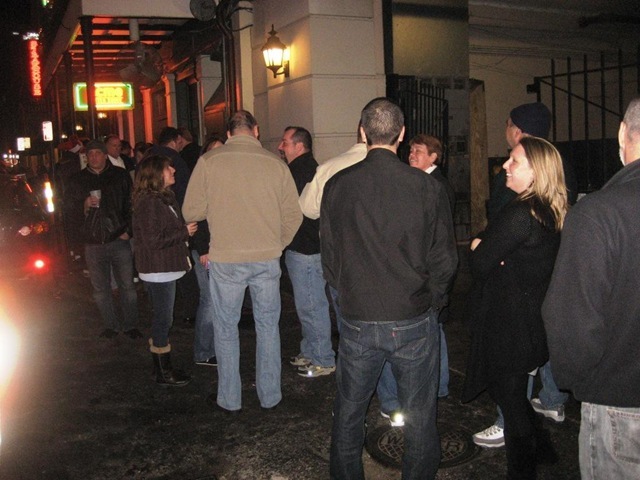 By the way, a bunch of people have left comments about how much fun they had in New Orleans or other random things about the city so I imagine many of you have visited yourself. Do you have any specific recommendations on places to go or things to see/do? We only have one plan so far – a cooking demo of authentic New Orleans cuisine on Saturday – so any ideas are much appreciated! Last night I had a healthy date with my friend Amber, so she came over and we went up to the gym to workout and then had dinner, wine, and talked for hours. It was such a fun night – and the perfect way to maintain a healthy lifestyle but still be social! Since I had a pretty intense workout Monday evening, I just wanted to run a bit last night and ended up doing 30 minutes on the treadmill then 5 minutes walking. I started with 15 minutes at 6.0 mph, and then moved it up by .1 every minute until I got to 7.0, and then started moving it back down by .1 every minute. To be honest I thought I had it set to 45 minutes, but apparently I had put in 30, so when it went into cool down mode I didn’t object and just walked for the 5 minute cooldown. 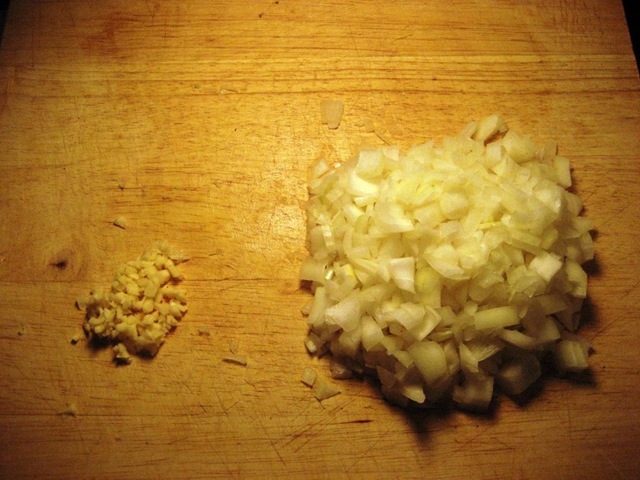 Start by chopping the clove of garlic and the entire onion. 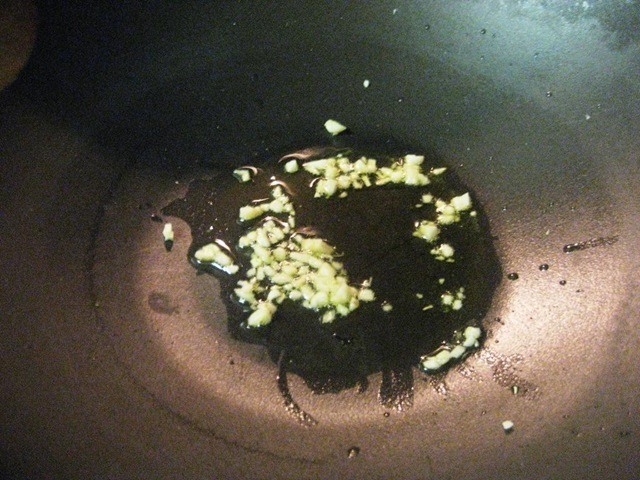 Heat 2 tsp olive oil in a pan, and then add in your garlic and onion. 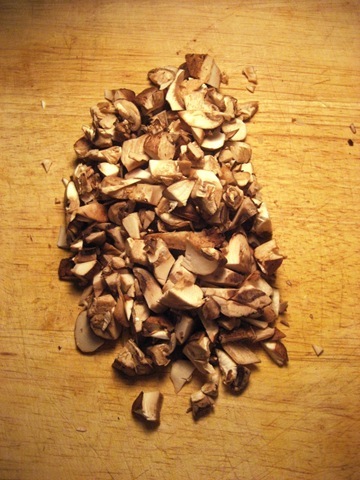 Once that goes for about 2-3 minutes and starts getting soft, add in your mushrooms. After that cooks together for another 1-2 minutes, add in the drained can of lentils, plus the packet of taco seasoning. Keep it over medium heat until the mixture is heated through, and then start mashing the mixture together with a wooden spoon or spatula. 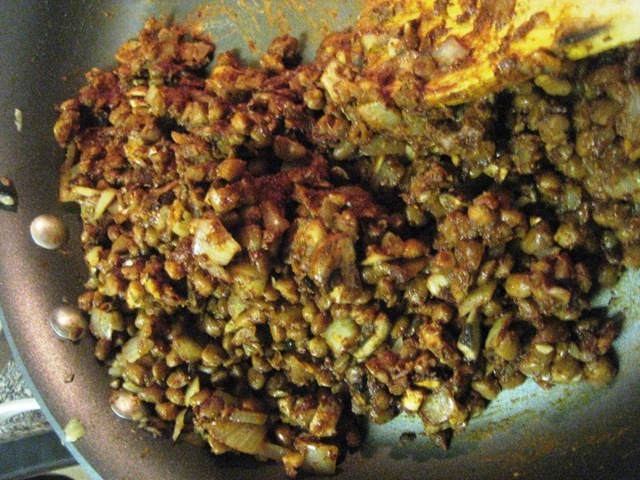 This was the perfect taco filling. 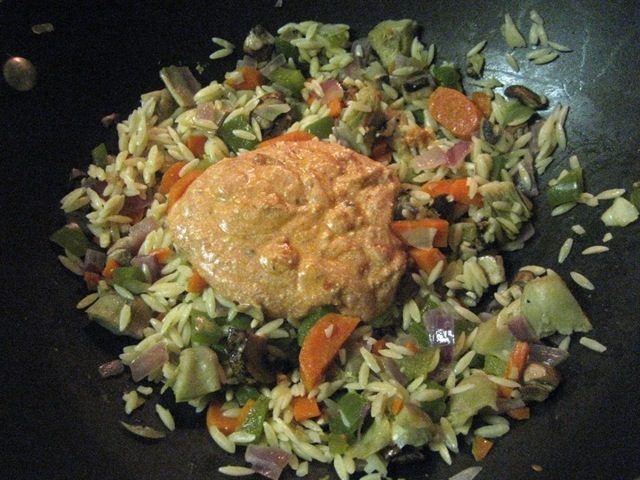 Super flavorful, delicious, AND healthy! We each started with two tacos. 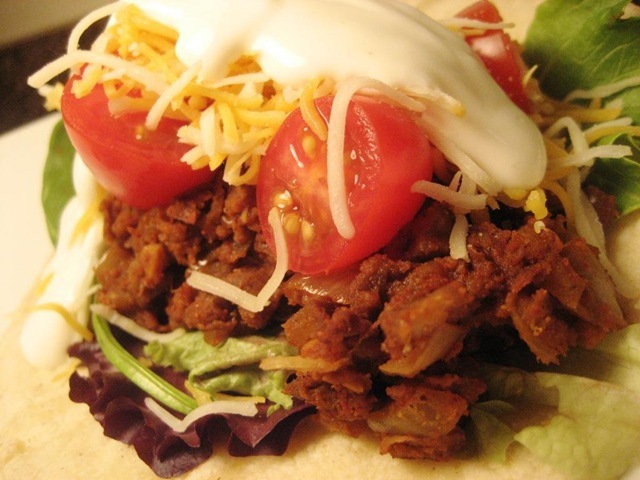 Spring mix, lentil mushroom taco mix, tomatoes, shredded cheese, and light sour cream. 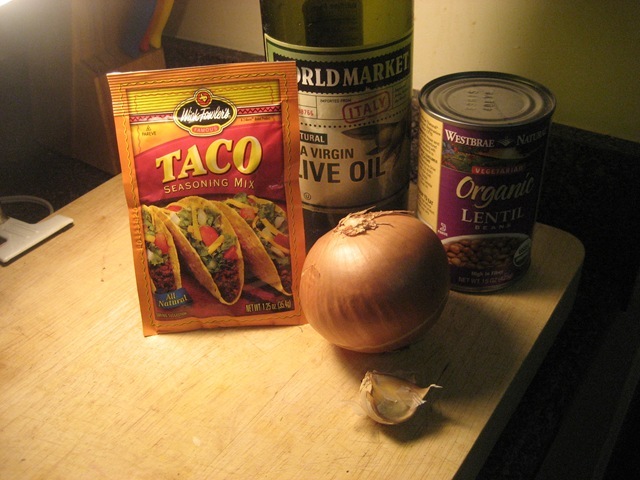 I love tacos because you can make so many changes to them based on what you’re craving (and what’s in your kitchen). We each ended up going back for one more because they were so delicious. 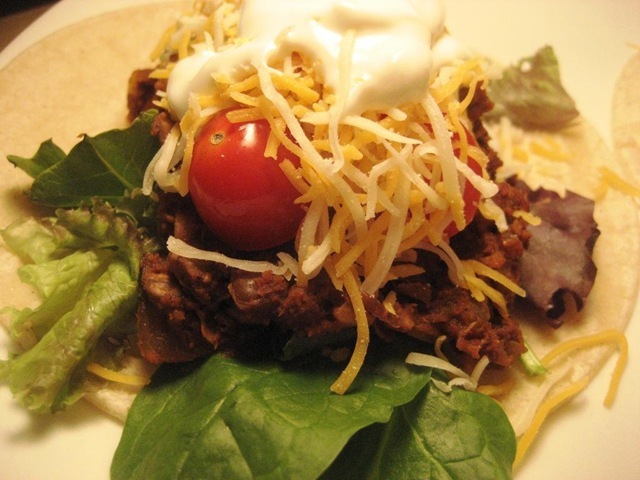 I think this is an awesome alternative to regular ground beef for tacos, and though it doesn’t taste like meat, its just as satisfying and could please a meat lover as well as a vegetarian. I can’t wait to make these for Wil because I really think he’ll love them even though he bleeds beef. What is your favorite kind of taco? I love fish tacos with fried fish and napa cabbage slaw – but these ones are a close second! Good morning! Thank you guys so much for all your responses on yesterday’s post about possibly rejoining Weight Watchers. It sounds like everyone who is following the new plan really likes it, and that it is much more in line with my current way of eating than the old plan was. I’m not gonna lie – it makes me a little nervous starting a brand new plan that I know relatively nothing about, when currently I can tell you the number of points in anything and calculate point values with a nutrition label in my head. But, people do best on a plan when its new to them, so maybe a revamped WW is exactly the thing I need. I know this goes against every theory on healthy living (why wait until tomorrow – start today!) but I’m highly leaning towards joining a week from today because I’m taking Wil to New Orleans for his birthday, and honestly I don’t want to think about points or limiting myself too much while I’m there – I just want to have fun and indulge. I found a really awesome post about the new WW plan here after a comment saying that Ms. Bitchcakes having a great post about it, in case you are curious yourself. Yesterday, I had a super clean day of eats and I’m happy to report that I’m also feeling a lot better and less bloated today. I stepped on the scale again this morning and was down another 3 pounds from yesterday. To clarify – I didn’t lose 3 pounds in one day, it was just bloat from eating fried foods/overindulging over the weekend. So with my weight from this morning, I’d still like to lose another 14 pounds or so to be at my goal. If anyone is in the DC area and is interested in joining WW at the 1411 K St location, email me at bethklein at gmail dot com so we can set up a meeting. I think a support group could be so beneficial. Last night I got in an awesome workout and then made a delicious and quick dinner. 15 shoulder presses at 15 lbs (on a machine) – up 5 lbs for the first time!!! 15 chest presses at 30 lbs (on a machine) – also up 5 lbs for the first time! 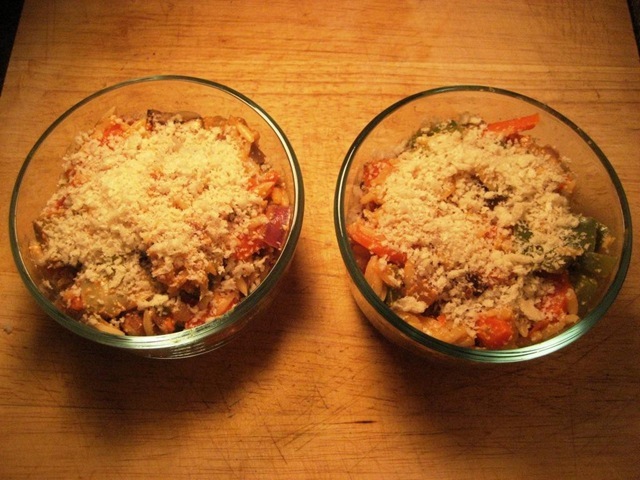 Then came the star of the evening – a Cheesy Veggie Orzo Bake. 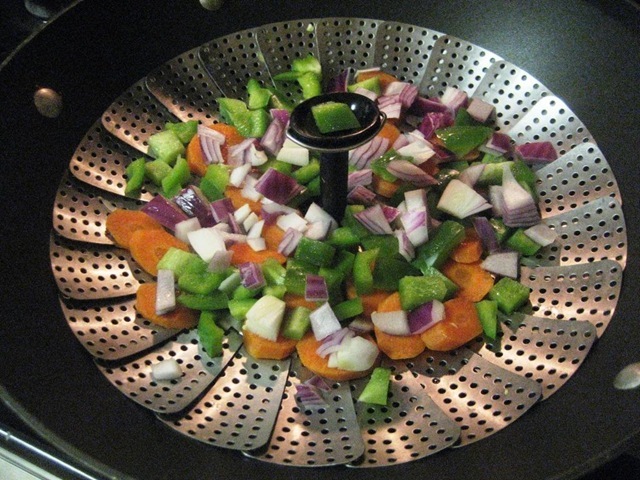 I started out by getting my veggies chopped and steamed. 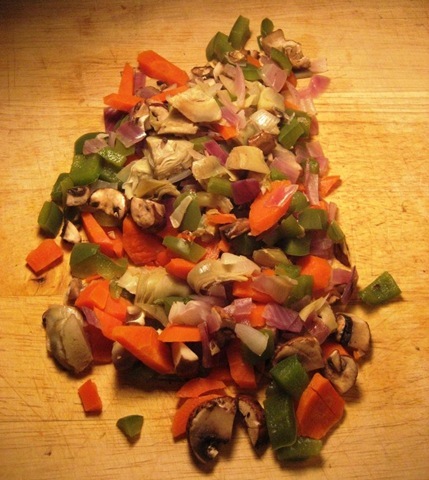 I used carrots, green peppers, red onions, mushrooms, and frozen artichoke hearts. 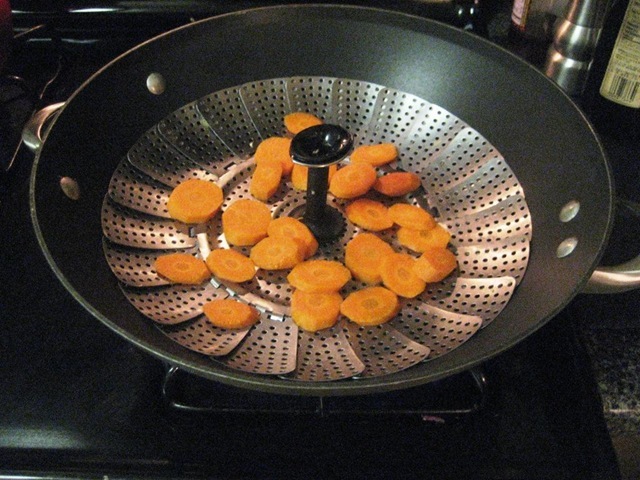 When steaming veggies, start with the ones that take the longest to cook first (carrots). Once those started to get a little soft, I added in some green bell pepper and red onion. And ended with some mushrooms and artichoke hearts (that were frozen). 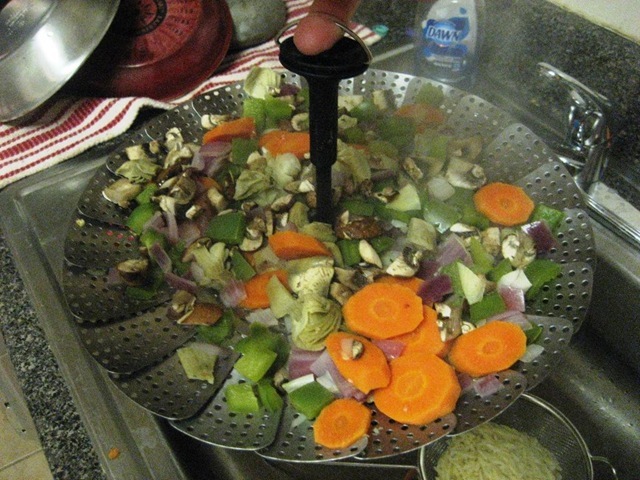 I love this steamer tool by the way – its so easy to use and awesome. 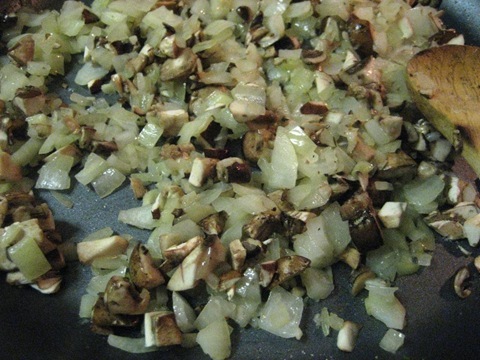 Once your veggies are steamed, roughly chop them and mix them together. 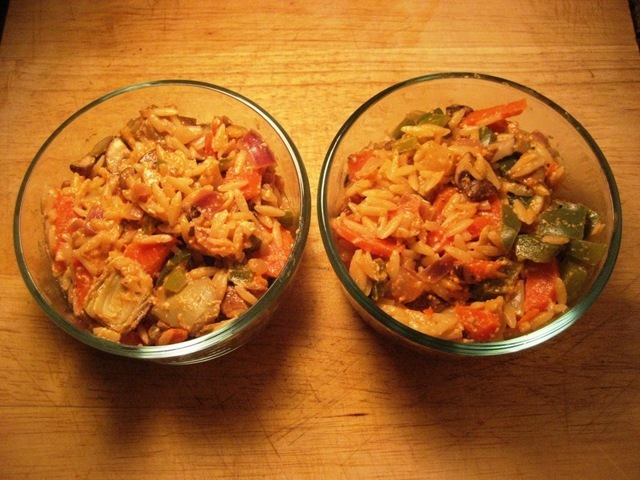 While your veggies are steaming, cook 2 servings of orzo to al dente (7 minutes), or any grain of choice. Heat 2 garlic cloves in a touch of olive oil. 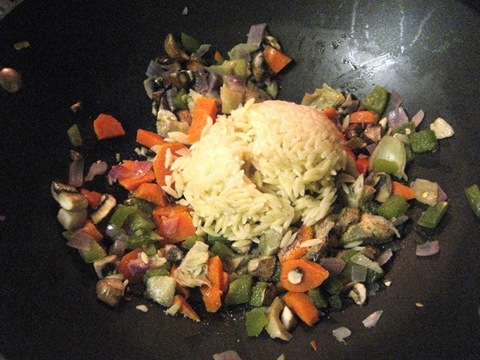 Then add in your veggies and your cooked orzo. 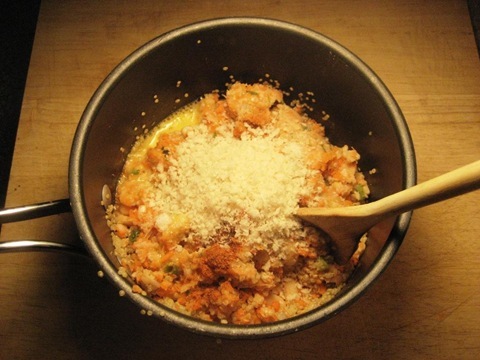 Mix it all together, and then add 1/4 cup of ricotta plus 1/4 cup marinara sauce combined. 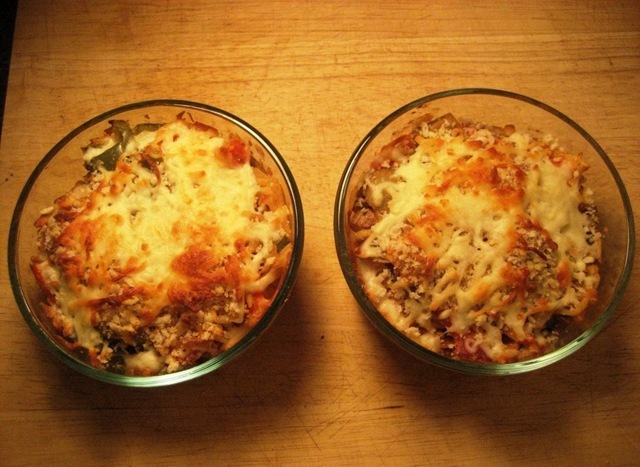 Once stirred together, divide evenly between individual casserole dishes. Top each with a sprinkle of panko bread crumbs. 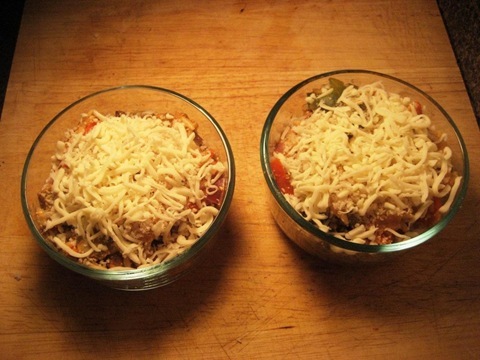 And then some shredded mozzarella. Bake at 375º for 20 minutes until hot and the cheese gets melted and a little brown and crispy. I showered while these were baking and timing worked perfectly. One for dinner, one for lunch, and seriously delicious. The best part about this dish is that its totally customizable to what you have on hand. If you want to add a protein boost, you can throw in some cooked chicken or beans. 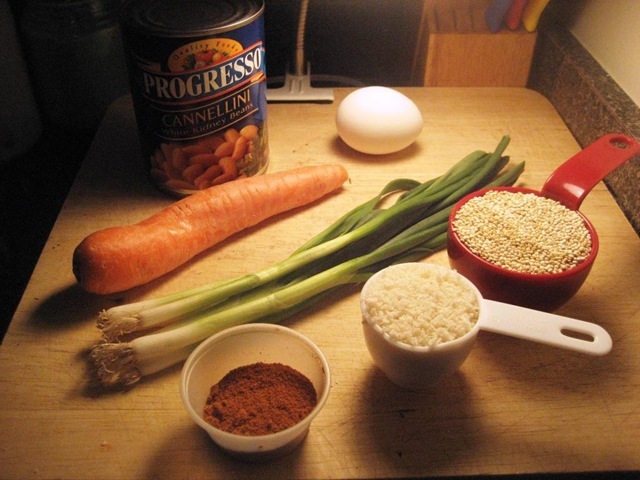 You can easily change up the veggies based on what you have in stock, and the grain is changeable too. Don’t have orzo? Use whole wheat pasta, quinoa, or brown rice. Enjoy! Tell me about your typical workout. 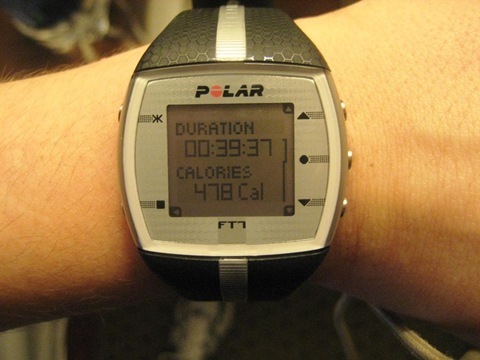 Do you normally do cardio, strength training, flexibility, or a combo? What type of cardio do you prefer?